Our short documentary Pipe Dreams will be playing both U.S. coasts this month. Already the film is having political impact. 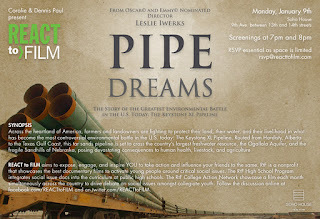 Fighting back against recent legislation which forces a State Department decision on Keystone XL within 60 days, the National Wildlife Federation has begun circulating Pipe Dreams this week to Members of the House of Representatives, the Senate, and the Administration. President Barack Obama received a copy of the film last month at the White House's annual Tribal Nations Conference, personally delivered to him by the president of the Rosebud Sioux Tribe in South Dakota. 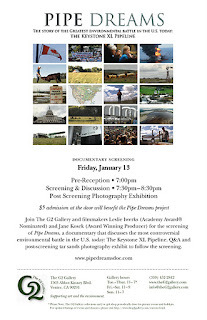 We have a screening on Monday January 9th sponsored by React to Film. If you haven't heard of React to Film and you are a documentary filmmaker then you need to know about them. They will take your film into high schools and onto college campuses. 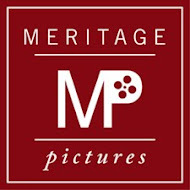 They also sponsor screenings at the Soho House in New York City and Los Angeles. These events are always a great time. 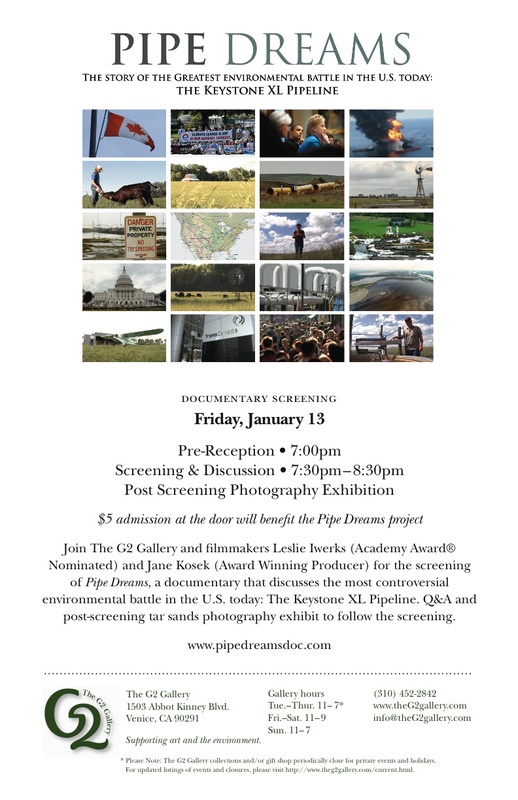 And for our Venice, CA screening on January 13th, we are playing at the G2 Gallery. It's a really cool space with beautiful wildlife photography on exhibit. Plus they are located on Abbot Kinney Blvd - a really fun street with amazingly delicious restaurants. So come on out if you can! Leslie and I will be at the Venice screening and doing a Q&A afterward.